The combination of malaleuca, peppermint, cedarwood, and eucalyptus essential oils is very relaxing. It's like going to a spa every time you take a shower :) Here is how you can make this soap yourself. Add dyes once the soap is melted. You can swirl colors by layering them. 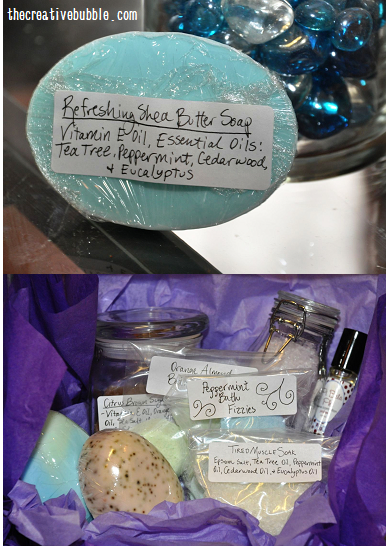 Packaging: I wrapped the soap in plastic wrap, and then sealed them with a label sticker that has all the ingredients on it, but there are so many other cute ways to wrap soaps. Once you have a melt and pour base for your soap you can be creative in choosing soap molds, adding your own colors, herbs, and essential oils. Bases and soap molds can be found at Michael’s, Hobby Lobby, and on Amazon. The Jo-Anns where I live doesn’t carry soap making products. There are also lots of melt and pour soap recipe books out there. I used the Shea Butter Melt and Pour Soap, and made two different recipes from one package split in half (it made four large bars).